Most workforce planning efforts are fairly short sighted and narrow, and could more accurately be called 12 month hiring plans. Strategic workforce planning promises to deliver greater value by using a longer time horizon and a talent supply chain approach. The problem, however, is that even then it’s still too narrowly focused on the low hanging fruit of butts in seats. In order for HR to really raise its game, workforce planning has to be much more focused on addressing holistically the systemic talent issues that impede business performance. Workforce planning traditionally has meant annual forecasts for how many people are needed in a role, with the forecasts happening less than six months before the end of the fiscal year as part of the budget-setting process. Strategic workforce planning focuses farther out on how the business’ needs will evolve over two or more years, to anticipate and solve talent gaps that are too hard to address in six months or less. For example, strategic workforce planning often includes identifying roles staffed with a large number of older people who are on the verge of retirement, and making plans in advance to ensure a stable talent pipeline of people to succeed them. Another common example is identifying key areas where the business plans to grow and calculating how to meet the talent demands and avoid shortages. That type of analytics is essential to avoid big gaps in the number of people needed to do the work. But that only focuses on who does the work, not how it gets done. Most of the people-related issues that arise from the work design cannot be easily addressed through adjusting headcount. The “how” is essential for truly strategic workforce planning because it opens the door to reconsidering the barriers to strategy execution that are rooted in how roles and responsibilities are designed, and the competency and recruiting profiles used to evaluate how talent contributes to organizational success. There is a great opportunity for heads of talent analytics and their teams to play an important role positioning their organizations for success through this work. But it requires a different orientation than thinking about the problem as workforce planning, one which looks beyond the job to the system of work in which the job is embedded. This includes taking into consideration business objectives such as capacity utilization, cost minimization and more. For people working in talent analytics, the issue is not much different from the business coming to you and asking for help on how to optimize productivity and employee engagement. The challenge is learning how to do so by looking at the bigger picture of the system of work, and incorporating perspectives such as job design and organization design which go beyond the data typically available for talent analytics. “Strategic” workforce planning today. Strategic workforce planning focuses on existing or new roles, matching up labor forecasts with analysis of the supply of people to fill those roles. For example, consider account managers at a bank. Strategic workforce planning would look at where the banks’ services are growing the most, taking into account which lines of business and geographies are expected to have the greatest increase in demand. It would then plan on hiring more account managers where the forecasted gap is highest. Yet forecasting the number of account managers and where they need to grow the fastest does not address any root causes of performance that come from how the work is designed. The ultimate goal is not necessarily avoiding vacancies in the account manager role. Instead, the bigger picture is how the bank delivers its products and services in a cost effective way. When talent analytics leaders take as given the way roles are currently defined, they perpetuate inefficiencies in the work design that can lead to hiring people who are over- or underqualified for the work, and overpaying for skills which aren’t needed or underpaying for ones that are. Any future looking strategy must take into account things like redesigning the work to increase efficiency and increasing opportunity for automation as a disrupter of work processes. In the bank’s case, the ultimate objectives are customer service, selling more high-margin products and services, and getting customers to use the bank for a greater proportion of their banking needs. Customer service is important because it keeps people from leaving, lowering the acquisition cost of the bank’s assets. Higher-margin products and services increase the bank’s profitability. Getting customers to use the bank for a greater share of their banking needs increases retention and lowers acquisition costs. Hiring more and better account managers may help the bank improve its performance along those dimensions. Account managers definitely contribute to customer service, higher-margin sales, and cross-selling. Yet they are only one contributor to improved business performance. Improving those business metrics often requires other changes in the work system that complement what account managers do. Take customer service, for example. Account managers are important contributors to the customer experience, but they alone do not define it. The phone system the customer first encounters when calling in, the employees who interact with the customer both in person and over the phone, and other employees in the branch aside from the account managers also contribute to customer service. Just focusing on the account managers alone through traditional workforce planning almost always won’t be enough to meet the bank’s objectives for customer service. You have to consider the broader ways the organizational system creates the customer experience. Apply job analysis for better workforce planning. The fundamental problem for talent analytics leaders is that “strategic” workforce planning focuses only on the number of people needed to fill anticipated vacancies. Taking a longer horizon look and considering the talent supply chain are useful innovations over traditional workforce planning, and those significant advances in the field have increased its relevance and contribution in recent years. Yet they are still too narrowly focused on the job as it currently exists. A much better approach diagnoses the job design to find the bottlenecks to performance, and uses that analysis to design more holistic solutions. Consider the example of health care. Doctors are the most expensive, highest-skilled labor in healthcare delivery and the main bottlenecks to improved, cost-effective performance. Having doctors spend more time on patient care is key to improving health outcomes in many settings, yet typically it is too expensive to just add more doctors. That’s why the health care system centuries ago created the role of nurse, a less expensive counterpart to doctors. For the longest time, nurses were the main workforce planning solution used to solve the problem of increasing the number of patients treated per hour each doctor works. However, in more recent decades nursing shortages have pushed the health care industry to innovate further, increasing the use of roles such as physician assistant to free up both doctors and nurses to treat more patients per hour. The insight of creating the role of physician assistant never came from a traditional workforce planning approach. It also never would have emerged from what passes for the current state of the art in “strategic” workforce planning, which focuses on existing roles. Instead, the analysis that led to creating the physician assistant role required a holistic diagnosis of the health care delivery system and the constraints on both doctors’ and nurses’ time. The key is expanding the analysis from focusing on vacancies and hours worked in one job (role) to the set of roles that make up a complete work process. So rather than focus solely on the physicians and how many hours they work, the diagnosis hones in on the number of patients served per hour the physician works. The key question is how to optimize the number of patients treated per hour by the entire system of roles, not just the single role of physician. If the total labor cost per patient served can be lowered, then the total number of patients treated per hour can be expanded more cost effectively than by simply adding additional physician hours. The larger point here is that the focus needs to start with the business objectives. In a healthcare system, for example, the strategic objectives are treating patients effectively and efficiently to minimize costs and optimize health outcomes. Workforce planning focuses only on jobs, not the other parts of the system that need to be optimized. In a hospital, capacity utilization (keeping the beds full) is a critical objective so that the fixed costs of running the building can be spread over as many patients per day as possible. In a medical practice, the same principle applies: keep the exam rooms full and minimize the amount of time needed to treat each patient by the doctors. The key for talent analytics leaders who want to improve the strategic relevance of workforce planning is to take the perspective of a forward thinking business partner. This means going beyond looking at the existing jobs and engaging in the “what if” questions around how best to optimize the work design. In the medical practice case, taking this approach broadens the scope of the analysis to include questions such as “how can we free up doctors to spend more time on effective patient care per hour?” Viewed this way, the solutions can come from many different approaches, not all of which involve traditional health care jobs. For example, electronic medical records cut down on the amount of time doctors have to spend reading paper records on patient care, while increasing the amount of information doctors can access while treating each patient; this happens through aggregation of medical records that previously were located in each doctor’s office and not instantaneously accessible by other physicians treating the same patient. Advocating for electronic medical records would never emerge from today’s strategic workforce planning approaches, and yet any conversations about implementing electronic medical records should include talent analytics representatives because of the new jobs needed to make it happen. Take a holistic view of the team, not just one job. The main message is that workforce planning has to go beyond the traditional focus on jobs and instead focus on teams. And rather than think about the work one role at a time, talent analytics leaders need to consider specific tasks and bottlenecks to performance that are rooted in parts of the job. Going back to our health care example, even today with the team approach of doctor, nurse and physician assistant, physician time is still the bottleneck to improved performance in many cases. If we could just free up doctors to spend more time with patients, efficiencies and patient outcomes could be improved further. The roles of nurse and physician assistant evolved as ways to take parts of the health care delivery system out of doctors’ hands and give them to others with different skillsets but who nonetheless can perform a lot of skilled tasks without needing a doctor in the room at the same time. The question is what additional changes or innovations can free up doctors further. The most recent answer is medical scribes. These are people who accompany doctors as they do their patient visits, transcribing the details of the patient’s condition and the doctor’s instructions for care. Using scribes frees up doctors from the very time consuming task of writing up the notes from the patient visit. The job of medical scribe would never have been identified by today’s strategic workforce planning approaches. Instead, a systems diagnostic of the work and the challenge of doctors’ time being very expensive led health care organizations to realize there was another way to cheaply solve the bottleneck of physician time. The solution lay in adding lower-priced skilled labor that frees up the doctor to spend more time on what only they can uniquely do: diagnose and treat patients. The job of physician assistant, like nurse, is a traditional extender role which requires medical training and decision making. The scribe role, in contrast, broadens the focus to include non-clinical roles. Medical scribes need to be skilled enough to write down accurately what they hear, but they do not have to be trained and certified as medical providers to add value. Medical scribe roles are a lot like court reporter roles: court reporters have to know enough about the legal process to record everything accurately, yet they are not as highly skilled on legal issues as lawyers or even law associates. The team-based diagnostic approach takes into account how the work is performed, and considers reconfiguring tasks across jobs to make more robust talent systems. These more robust systems can increase flexibility and efficiency by identifying the optimal way for the organization as a whole to function. Take for example the different tasks that have to be performed in supply chain operations. Optimizing the supply chain includes determining which tasks and roles can be outsourced when there are suppliers that have expertise that complements or even exceeds what the organization can do on its own. Yet the decision on outsourcing is not a simple one of the cost of services and availability of people to provide them. Even more critical is how those services fit into the creation and preservation of the company’s competitive advantage. Evolution in organizational size, complexity, product offerings, competitive threats, and technology combine to create a dynamic reality for organizations. The perfect solution two years ago may be suboptimal today. Something impractical two years ago may offer significant competitive advantage today. For example, in the near future, the role of scribe may further evolve to be completed by a virtual digital assistant, as voice recognition capability improves. Workforce needs are not static. To succeed, organizations must continually adapt and adjust their workforce planning. Digitisation is here to stay so organisations should consider treating it as a long-term investment. The new evolving ecosystem of mobile computing, interactivity and data gathering presents an opportunity to craft new value propositions. This is just as well since the era of “easy” global growth becomes less likely to continue. While population increase and mass consumer markets gave traditional businesses opportunities to grow in the 20th century, the wave of the future is more likely to centre on creative recombinations of technology and people, something digitisation encapsulates. Management waves and new technologies have come and gone before, from cassette tapes and fax machines to business process reengineering and Six Sigma, which makes it easy to dismiss digitisation as a fad. But executives we recently interviewed for a research article share a belief that despite the growing access to computers and data over previous decades, digitisation is just starting. The managers and leaders we interviewed were actively involved in shaping the digital future of media companies (books, music and television). We also spoke to managers in banking, ship building, retail and consulting to understand more from companies where the product is less likely to be digitised. 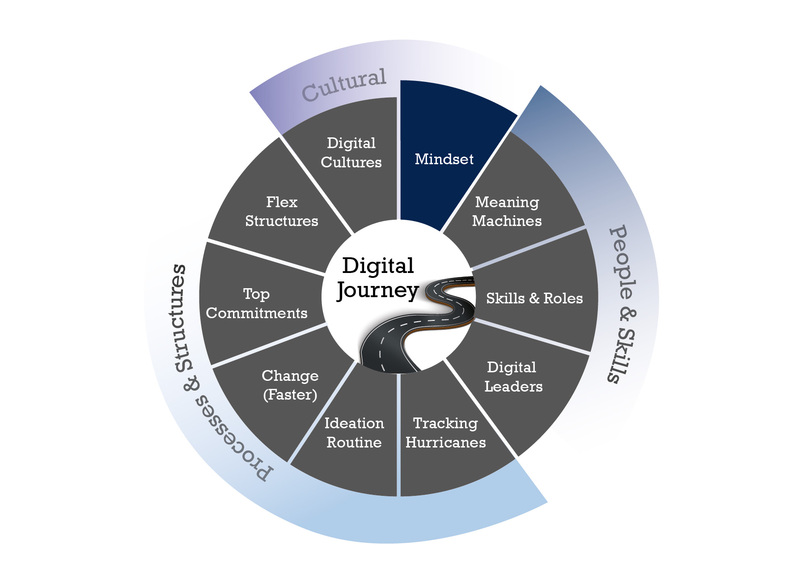 While this work is ongoing, below is the first of several instalments explaining the framework we see emerging: 10 checkpoints on the digital journey that companies face. In later articles, we will expand on these points, which include skills and roles, structures and processes, and cultural aspects. We will start and end with cultural aspects, specifically checkpoint one, the mindset shift. While companies need to respond to this new reality seriously, there is no recipe for transformation. 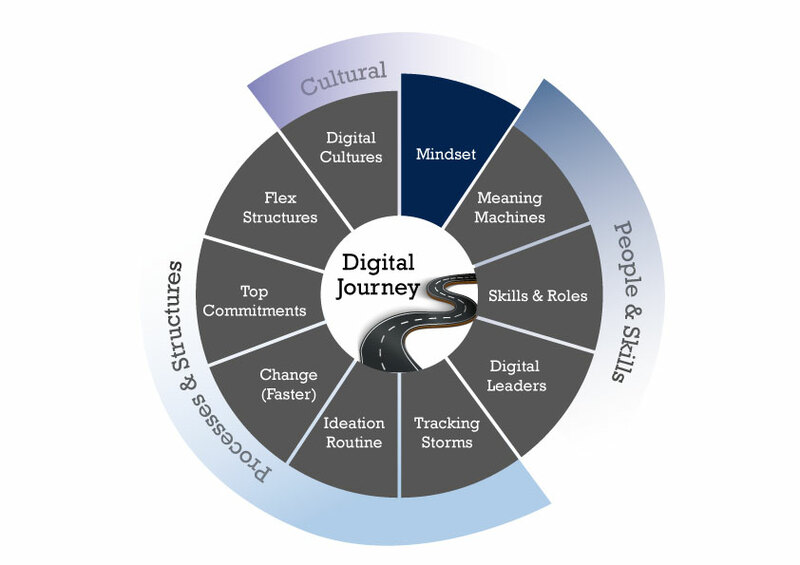 “Going digital” or “digitisation” is often characterised as a transformation, suggesting that organisations embark on a caterpillar-to-butterfly metamorphosis with a clear start and finish and emerge ready to take flight as digital leaders. The lessons from companies well down the road of digitisation show that framing it as a journey is a better starting point. Our study revealed the issue of mindset as the first of 10 dimensions companies would do well to consider throughout this journey. Interviewees for our study were willing to experiment and start early, iterate and grow in capabilities and know-how, which are important ingredients for any organisation looking to adapt to a fast-moving environment. According to a theory of organisational behaviour called “absorptive capacity”, companies who amass foundational knowledge, skills and ideas build the capacity to absorb new ideas faster. Absorptive capacity is defined as a company’s ability to recognise the value of new information, assimilate it and apply it to commercial ends. Absorptive capacity depends on prior knowledge, because knowledge is cumulative. In the same way a student doesn’t go from learning simple algebra to doing advanced calculus overnight, organisations can’t run before they can walk. In short, they don’t just become digital by buying or creating a new technology; they build ongoing capabilities and knowledge over time. The good news from this example is that it’s not too late, or indeed too early, to get involved. For the company above, its earliest foray into e-books was not a commercial success, but it was an invaluable learning process and set it up for the e-book wave. It’s also important to frame digitisation as being less about computing-based efficiencies than about organisational effectiveness. Companies are fairly confident that the software infrastructure will exist for them to create platforms and gather data. What is most important is understanding the potential of technological developments to shape consumer experiences. The processes organisations should adopt to become digital are not necessarily themselves “digital”. Technology is important but it’s not the essential component. Our interviewees gave us the sense that they were overwhelmed with data, not least because data have become so fine-grained and instant. Acting on constant feedback and insights, but without jumping at every data point, will be crucial to leveraging data effectively. In my next article, I will expand on how organisations can leverage these bigger analytics to derive larger meaning and what skillsets organisations will need to use such tools effectively. As we learnt from those who see digitisation as a journey, the focus today is less on data and storage than on analysis and ideas. I also believe the data driven ability for an organization’s HRBP team acts as either a limiter or enabler of success & credibility for HR. Sadly, this is a universal challenge. It’s this realization that motivated me to write a practical guide for HR Business Partners to become data driven. These guides, or Playbooks, have been developed with one purpose - to help build the capability for data driven HR in businesses. Before we go any further, if you’d like a pdf copy of these 4 Playbooks - give me a thumbs up, tweet, share or make a comment on this LinkedIn Article - and then use the Download Link to get the full 100+ page PDF. The Playbooks are based solely on my first-hand experience as a consultant, a business partner to many technology organizations, an entrepreneur across a few different businesses - one of which was focused on helping organizations build sustainable change programs - and finally, as an all-in participant in the emerging field of people analytics. It may not meet everyone’s expectations. It's long. Too detailed in places. Not so much in others - but it is a start because I truly feel that the success of people analytics at-large is constrained by the ability of HR Business Partners to use their HR, talent and productivity data to drive better business outcomes. I've designed it in 4 sections because I believe that the strong ability of one (or a small group) of data- & business-savvy HRBP(s), while directionally correct and stoic, is not sustainable. That’s why organizations need to build a comprehensive capability - to plan, fund, engrain, lead, test, improve and unlock the potential that’s trapped within their people data - across the board. These Playbooks will help you do that. Select and implement the components that work for you. Overall, my hope is that leading organizations will see the light and chase this largely untapped opportunity - with or without any help from this Playbook. Here’s an overview of the 4 Playbooks. When it comes to the People Plan, Ops will always have different objectives, drivers and issues than Sales - but there will also be common ground. Therefore, it is imperative that HRBPs have solid understanding of both corporate/ enterprise-wide people objectives, in addition to the specific objectives of the business units they serve. It must be recognized and addressed that some HRBPs are more naturally analytical, business-savvy, data-driven and strategic than others. It's therefore becoming more commonplace that HRBPs build upon their transactional HR skills & experience, becoming change enablers and helping drive the people-side of business outcomes. This means articulating the opportunity and understanding the issue, consulting, driving decisions, planning & implementing change, and optimizing results. Slick tools can flounder if they don't live within an environment - or capability - which supports their purpose. For an HRBP to be successful in Data Driven HR, there must be a framework, strategic focus and processes in place to ensure the relevant data is both captured and trusted, clarity in the role of the HRBP, and of course, visibility, realization and optimization of hard business results. "Becoming Data Driven" implies change will occur - and this change must be sustainable and not just a one-off project. These 4 Areas of Focus must work in concert with one-another to ensure clarity of purpose, adoption and motivation for the future state, leadership support, a concrete plan for implementation, in addition to clearly defined, yet achievable success. Learning is a key part of work, and science says it will continue to be vital in the workplace of the future. So what is holding people back from seeing L&D’s value? L&D teams are struggling to measure the effectiveness of training outcomes. Analytics is critical to the measurement process, yet according to a survey of L&D organization from Bersin by Deloitte, only 10 percent of survey participants say they are “very effectively able” to use data and analytics to respond to shifting or time-sensitive business needs – and the research shows that L&D’s reliance on Learning Management Systems (LMS) is to blame. The LMS is a foundational system for most L&D organizations, and 64% of them consider custom LMS reports or dashboards “the most useful tool” for tracking, measuring, and evaluating learning. The lack of analytics support in current L&D tools prevents learning organizations from being more efficient, developing stronger relationships with clients and business leaders, and proactively providing the business with better data for decision-making. And this will only become more difficult to achieve as L&D functions modernize and incorporate new learning methods and devices into their technology stack, further complicating the process of tracking since most LMS’s can’t combine data from other systems in reporting outputs. 1. Does L&D make our employees stay? With voluntary resignations at an all-time high and unemployment rates historically low, employee retention is a key objective for most organizations. L&D can address this problem because “when employees perceive that their organizations encourage career development, they feel more confident about their long-term career path.” In fact, a Culture Amp study found that people who stay with an organization are 24% more likely to say that they have had access to the learning and development they needed. Surface insights on how L&D is impacting employee retention, such as what training programs produce the cohorts with the longest tenure and whether the savings from reduced turnover justify the costs of key programs. With this information, you can determine which levers to pull to further increase employee retention based on the programs the data has revealed as most successful. 2. Does L&D help our employees perform better? Simply put, strong performers can make the difference between hitting business objectives and missing them. In fact, 37% of High-Performing Organizations (HPOs) report above average revenue growth for 2016 compared to 20% of Low-Performing Organizations. Performance is strongly tied to L&D, but without analytics, it’s difficult to tell how exactly learning affects employee performance. This is because human performance is varied and assessment needs to take place over time. Therefore, in assessing L&D impact, you need access to data from the entire employee lifecycle. Get a complete picture of learning throughout an employee’s tenure at your organization. This is only possible if you have a learning analytics solution that can connect all your HR and business systems together – whether it’s your performance management, HRMS, or financial performance tool. AND look at the relationships in this data over time frames ranging from months to multiple years. This single source of data truth enables you to track what the ratio of high-performers are to non-high performers who do training, how long it takes performance to improve after training, whether training and certification programs have an impact on improved financial performance, and more. 3. How does L&D contribute to employee engagement? On its own, employee engagement is a traditionally difficult metric to measure. However, studies show that L&D plays a role in engagement scores: one study in particular suggests that 41% of the variance in engagement is driven by activities that learning and development professionals have the opportunity to influence. In turn, 70% of the variance in performance ultimately can be explained by the degree of engagement. Examine employee engagement within locations, departments, and teams to discover if those who are highly engaged are the same individuals that have recently completed a professional development program. Likewise, learning data can reveal which groups have the lowest engagement, what factors may be contributing to this low score, and whether more training could improve the situation. 4. Who would benefit most from L&D? Roles are becoming increasingly specialized, which means a “one size fits all” approach will not work. In fact, 68% of L&D providers indicate role-centric approaches (i.e., role-specific, individualized approaches to learning design and delivery) are “Very Valuable” or “Extremely Valuable. By focusing efforts on those employees that are more likely to make a positive impact on the bottom line, L&D teams can create more specific career development programs that will hopefully increase profits and productivity. Identify the individuals who have benefited the most from training over the past few years – these are your high performers who have been promoted within the shortest amount of time. You can focus some of your programming on this group. Likewise, look for the employees who have re-certification deadlines to meet as they should have priority. You could also use cohort analysis to determine which other employees have the potential to be high performers based on common attributes with your current stars. These employees could benefit the most from a targeted career development strategy. Furthermore, you examine the common attributes of employees who have never done training to see what effect this has on performance and whether a new L&D program for this group is warranted. 5. Would we be better off without a specific L&D program? Knowing what’s not working is just as important as knowing what is. Just as great HR strategy shouldn’t be about making HR better but rather the business, the L&D organization must focus on business outcomes in order to prove that it is a competitive advantage. When L&D professionals can tie learning outcomes directly to business results, it becomes much easier to determine what programs should be cut or reworked. Compare learning metrics directly to business metrics so you can analyze whether, for example, a specific training program had an impact on this quarter’s financial results or if changes to manager training hours is linked to changes in revenue per employee on their team. Connecting learning analytics to business data has traditionally been contingent on time-consuming, expensive data warehouse projects or hundreds of person hours going through spreadsheets and generating reports from various HR systems. Both methods involve long and tedious processes, which prevent L&D teams from quickly acting on data so they can proactively make decisions that could impact the bottomline. Another option is to look into cloud-based learning analytics technology, which connect HR and business systems together, and offer the end-to-end view needed to quickly answer L&D’s critical questions and measure their total contribution to business goals. Access to those kinds of insights will not only help L&D run more efficiently, but business leaders will also have the facts needed to properly invest in their employees career development. Predictive analytics is often seen as the Holy Grail of talent analytics. Bersin argues that a journey to a mature talent analytics function is a continuing investment that moves HR from operational reporting to forecasting future talent outcomes. Similarly many HR practitioners are obsessed with the idea that predictive analytics is a solution to a better future- one that create better talent outcomes and efficiency gains. I want to challenge that view and reframe the debate. First of all, ‘better talent outcomes’ shouldn’t be the ultimate goal of HR’s effort. HR goal’s should be tied and aligned to the higher organisational goals. The terms HR analytics, talent analytics and people analytics have often pigeonholed the work that HR is doing into ‘HR for HR only’, instead of ‘HR for the whole organisation’. Let’s talk about the five key mindsets that HR can change to win the heads and hearts of stakeholders across the business. For HR to become a strategic force in the business, it needs to broaden the scope of its analytics agenda to organisational design and start blending people data with business data. It needs to ask the question, how good is my workforce in executing the business strategy? This fundamentally lies beyond just looking at people data in your payroll or HR Management Information Systems (HRIS), but blending it with business data. By pulling these datasets together, HR will be able to give insights beyond simple HR metrics but to answer questions that will be valuable throughout the organisation. For example, they can start to analyse: relationships between employee absence and productivity; which competencies of the sales force best predict sales productivity; what the impact of various training programs are on various outcomes, e.g., CSAT, engagement, retention, productivity and so on. HR shouldn’t be seduced by the allure of predictive analytics. It’s not that prediction isn’t important, but in the world of HR analytics, the importance is overplayed. For example, Bersin’s model positions predictive analytics as the final stage of the analytics maturity journey. In reality, predictive analytics is not that difficult to do and can be done along with operational reporting and analytics. There are already tools in the market that can help people to do predictive analytics—performing scenario modelling or forecasting future headcounts against sales target. Having prediction is desirable, but the real value lies in taking action. Can HR use the foresight they get to take preventive actions? Is there a feedback loop that drives insight to action to result that in turn brings new or additional insights? Is the iteration cycle fast enough to be valuable? Organisational data contains a goldmine of information (download chapter), but where do you start? How do you ensure the insights you look for are valuable to the business? Use a top down hypothesis-led approach. Start by defining the key objectives that stakeholders across the business want to prioritise. For example, if the business is trying to boost productivity through centralisation, build a series of hypothetical questions such as: are some departments more productive than others? Does training affect productivity? Where do our top performers come from? Once you build a rigorous hypothesis tree, you can then guide your analysis plan by focusing on the right metrics. Watch out for my next blog to understand the hypothesis-led approach in greater depth. Different types of analysis will require different data models and therefore different technology platforms. Managing relational data (e.g. organisational data) vs streaming data vs fast-moving, semi-structured data will require different platforms. For example, while a data warehouse is fit for storing streaming data, it is not suitable for scenario modelling. There is Hadoop for handling fast-moving, semi-structured Big Data and OrgVue for collecting, cleansing, and modelling organisational data on the fly. Other tools such as Alteryx is great for transforming and blending data, R for performing advanced statistics and Tableau for visualising data. A common mistake is to think there is a ‘one-size fits all’ platform that can solve all of your data purposes. Most of the time, in your analytics project, you will need a portfolio of tech platforms and a mechanism to move data across them – configuring which one is the master and the slave. Implementing a robust data management plan is fundamental for success. When you pull data together from various sources, there will be data quality issues. How can you make this process easy and valuable for all? Gamify and crowdsource the process. In other words, make it fun, interactive and visual for people to provide and alter data. Agree upfront on the rules on data structure, collection process and storage with your data owners and clean it centrally. There are tools in the market (including OrgVue – watch features) with fast-feedback, surveying and visualisation capabilities which can instantly update a person’s data record once completed. The key is to make the data upload process as quick and mobile as possible. For example, sending out a short webform that can be accessed through smartphones and tablets, will make it easy for data owners to provide input, review charts and add insights. When HR gets these five mindsets right, HR will be able to make the most of organisational data and analytics. It will be an invaluable resource to the business that can drive leaders to think through what their people do now, what they need to do in the future and what the impacts will be. For global businesses, the past two years have been a period of turbulence. Amid substantial global uncertainty – speculation around the impact of Brexit, the recent US presidential election and heightened trade regulations in some countries, many businesses are facing poor organic growth prospects and considering a major restructuring. But is major restructuring the right move? Figure 1. Sunburst visualisation of an organisation’s current structure coloured by role in OrgVue. Tracking progress and impact is essential, and you need to support this with clear, engaging ways of presenting that story to help bring on board sceptics and drive actions.